Motorists are urged to plan ahead this weekend as the vehicular traffic through the east end of Thousand Oaks will be heavier than normal. The city will be hosting Stage 8 (the final stage of the race) of the 2014 Amgen Tour of California Bike Race. The race will consist of three 21 mile circuits and three 4.5 mile circuits. On Saturday, May 17th at 8:00 a.m., parts of Townsgate Road and Village Glen Road will be closed to set up the course. 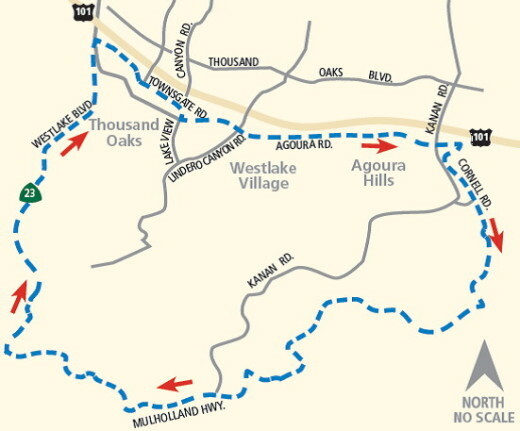 The race will begin and end on Townsgate Road between Westlake Blvd and Lakeview Canyon Road. This area will remain closed until Sunday, May 18th at 10:00 p.m. The race is scheduled to start just before 8:45 a.m. on Sunday. There will be rolling closures along the race route. 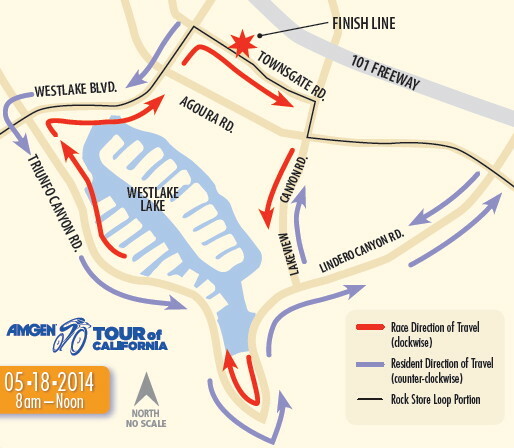 The race is expected to end around 12:00 p.m.
HARD CLOSURES during race: Westlake Blvd. southbound at Potrero Rd., and Westlake Blvd. northbound at Agoura Rd./Hampshire Rd. - then expanding to Triunfo Canyon Rd. during the small circuit. During this time, the Thousand Oaks Police Department urges motorists to use extreme caution in an around the affected area. There will be a large number of cyclists and pedestrians in the area. Please plan ahead and use alternative routes if possible.